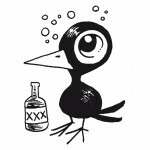 « Game Recap: BlackHAHAHAHAwks, You Lose! Bruins legend Milt Schmidt turns 98 years old today! His illustrious Hall of Fame career has been truly foundational for the Boston Bruins, spanning playing, coaching, and managing. Schmidt is a four-time Stanley Cup champion – twice as a player and twice as a general manager, all with the Bruins. Schmidt was born on March 5, 1919 in Kitchener, Ontario. He was a childhood friend and junior hockey teammate of fellow Bruins legends Woody Dumart and Bobby Bauer. All three of them were acquired by the Bruins in 1935, and together they formed the legendary Kraut Line. The Kraut Line led the Bruins to Stanley Cup championships in 1939 and 1941. In 1940, they became the first line in NHL history to go #1, #2, and #3 in scoring, with Schmidt leading the league with 22 goals and 30 assists. They famously interrupted their careers during World War II by enlisting in the Royal Canadian Air Force from 1942 to 1946. 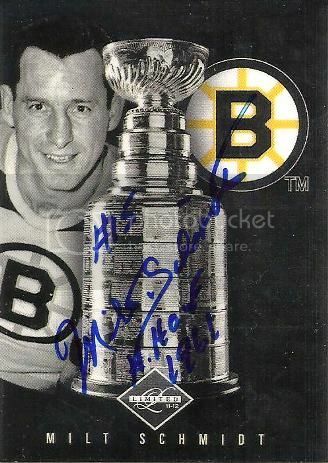 Schmidt retired as a player to be come head coach of the Bruins in 1955, having scored 229 goals and 346 assists during his playing career. Those numbers may seem low today, but at the time of his retirement, he was fourth all-time in goals scored and third all-time in assists. After coaching the Bruins for eleven seasons, Schmidt was promoted to general manager in 1967. He was the architect of the Bruins rennaissance, building a team that would win Stanley Cup championships in 1970 and 1972. His most famous move – and one of the most lopsided trades in NHL history – sent Pit Martin, Gilles Marotte and Jack Norris to the Chicago Blackhawks in exchange for Phil Esposito, Ken Hodge, and Fred Stanfield. It’s fitting that he celebrates his birthday today – the Bruins host the Washington Capitals tonight – as in 1975 he became the Capitals’ first ever general manager. Milt Schmidt was inducted into the Hockey Hall of Fame in 1961. His number 15 was retired by the Bruins on March 13, 1980, along with Johnny Bucyk’s number 9. Raising a player’s number to the rafters wasn’t in practice back then, so on October 28, 2010, the Bruins honored Schmidt with a number-raising ceremony. Happy birthday to a man who has truly meant everything to the Boston Bruins! Looks like an A to me! -The Bs can break Washington’s 5-game win streak vs. Boston (dating back to March 2014). They can finish the 4-game homestand 3-1-0, including wins against the 2 top teams in the NHL. -It would get the Bs record back to .500 at home. -Back-to-back games in Flordia against our division co-leaders will be a lot better if we’re riding a winning streak. -Washington is the only team in the NHL that hasn’t lost back-to-back games in regulation this season. They lost to the Rangers last night, so we’ve got a chance to put an end to that. -Holtby probably won’t be in net tonight. -Washington will be playing their 4th game in 5 days. -If we win tonight, we could be one of the division co-leaders (if ARI beats FLA & CAR beats TBL). All kinds of meaningful games today. I’m watching Minnesota struggle against the Sabres right now, and will switch over to Avs @ Predleys when it’s over.